Seven-time Tour de France winner Lance Armstrong has announced he will no longer fight drug charges from the US anti-doping agency (USADA). In a statement the American, 40, maintains he is innocent, but says he is weary of the "nonsense" accusations. USADA says it will ban Armstrong from cycling for life and strip him of his seven Tour de France titles. "It's most unlike him to withdraw from a legal argument. But in doing this maybe he is denying USADA the chance to directly put their evidence to him and reach the conclusion that they were probably going to come to. "He is not admitting guilt but most people will assume in their own minds there is some kind of admission given he is not contesting the charges when his legacy is on the line." "I refuse to participate in a process that is so one-sided and unfair," said Armstrong of the USADA proceedings. USADA chief executive Travis Tygart responded: "It is a sad day for all of us who love sport and our athletic heroes." Armstrong retired from cycling in 2005 after the last of his seven successive Tour de France titles, although he returned to the sport between 2009 and 2012 as part of the Astana and then RadioShack teams. USADA alleges he used banned substances as far back as 1996, including the blood-booster erythropoietin (EPO), steroid and blood transfusions. On Monday, Armstrong failed in his attempt to block the charges in a US federal court. The Texan had claimed that the agency was acting beyond its remit and had offered "corrupt inducements" to other riders to testify against him. "There comes a point in every man's life when he has to say, 'Enough is enough.' For me, that time is now," Armstrong said in the statement. "I have been dealing with claims that I cheated and had an unfair advantage in winning my seven Tours since 1999. Over the past three years, I have been subjected to a two-year federal criminal investigation followed by Travis Tygart's unconstitutional witch hunt. "The toll this has taken on my family and my work for our foundation and on me leads me to where I am today - finished with this nonsense." Armstrong had been given until 06:00 GMT on Friday to decide whether to continue fighting USADA's charges. The agency has said that 10 of Armstrong's former team-mates are prepared to testify against him. USADA also accuses Armstrong of being a "ring-leader" of systematic doping on his Tour de France winning teams. "If I thought for one moment that by participating in USADA's process, I could confront these allegations in a fair setting and - once and for all - put these charges to rest, I would jump at the chance," added Armstrong. Tygart said shortly after Armstrong's statement that his agency would ban Armstrong from cycling for life and strip him of his titles. "This is a heartbreaking example of how the win-at-all-costs culture of sport, if left unchecked, will overtake fair, safe and honest competition," he said. "But for clean athletes, it is a reassuring reminder that there is hope for future generations to compete on a level playing field without the use of performance-enhancing drugs." However, Armstrong has disputed that USADA has the power to take away his titles. "USADA lacks jurisdiction even to bring these charges," his statement said. The cycling governing body the International Cycling Union (UCI) - which had backed Armstrong's attempt to challenge USADA's authority - has so far made no public comments on the latest developments. 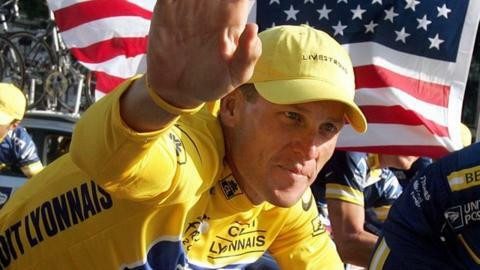 World Anti-Doping Agency president John Fahey says Armstrong's decision to drop his fight against drug charges, which could have been escalated to the Court of Arbitration for Sport, was an admission the allegations "had substance in them". Armstrong, who survived testicular cancer prior to his record-breaking Tour wins, says he will be focusing on the work with his cancer charity.